Fittingly on the day Nexus 6 pre-orders went live, Google has officially unveiled an updated Play Movies & TV app with a look inspired by Material Design. That is not all that has changed, though, as the app is gaining automatic Info Cards, a tweaked “Watch Now” tab, plus a new icon. The influence of Material Design is everywhere. The slide-out menu has shed its Holo appearance, buttons and iconography float above parallax images, and every header is distinctly red. The result is a much cleaner, more intuitive interface. 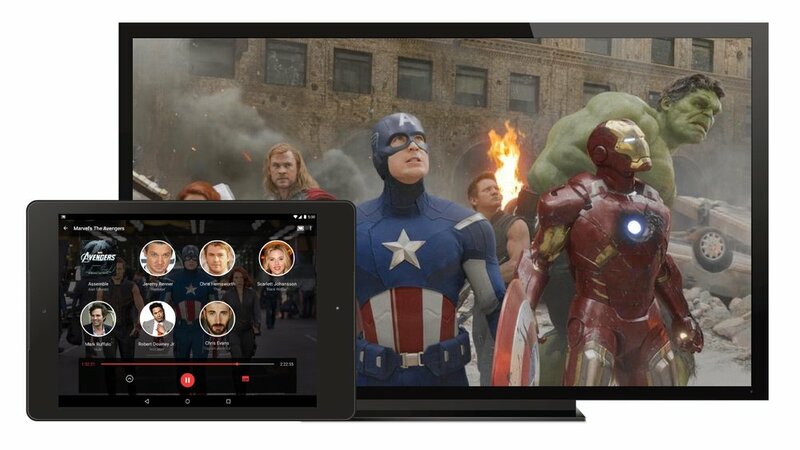 The coolest feature of the update requires the use of a Chromecast or Android TV device. While you play back a film or television show on your TV, Info Cards, which are bubble-shaped icons with information about actors, will appear on your smartphone or tablet in sync with scenes. Even sweeter, specific cards will enlarge when certain actors are speaking. The new Watch Now tab has been adjusted to show more movie recommendations, and now includes trailers for each within the app. The update will begin rolling out to everyone over the next week, according to Google.